For other uses, see Arsenic and Old Lace (disambiguation). 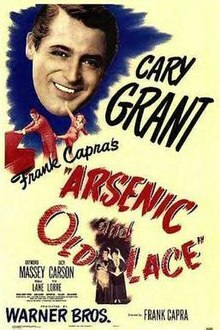 Arsenic and Old Lace is a 1944 American dark comedy film directed by Frank Capra, starring Cary Grant, and based on Joseph Kesselring's play Arsenic and Old Lace. The script adaptation was by Julius J. Epstein and Philip G. Epstein. Capra actually filmed the movie in 1941 because of star Cary Grant's availability, but it was not released until 1944, after the original stage version had finished its run on Broadway. The lead role of Mortimer Brewster was originally intended for Bob Hope, but he could not be released from his contract with Paramount Pictures. Capra had also approached Jack Benny and Ronald Reagan before learning that Grant would accept the role. Boris Karloff played Jonathan Brewster, who "looks like Karloff," on the Broadway stage, but he was unable to do the film as well because he was still appearing in the play during filming, and Raymond Massey took his place. [Note 1] The film's supporting cast also features Priscilla Lane, Jack Carson, Edward Everett Horton and Peter Lorre. Josephine Hull and Jean Adair portray the Brewster sisters, Abby and Martha, respectively. Hull and Adair, as well as John Alexander (who played Teddy Brewster), were reprising their roles from the 1941 stage production. Hull and Adair both received an eight-week leave of absence from the stage production that was still running, but Karloff did not as he was an investor in the stage production and its main draw. The entire film was shot within those eight weeks. The film cost just over $1.2 million of a $2 million budget to produce. The Brewster family of Brooklyn, New York, is descended from Mayflower settlers. Several illustrious forebears' portraits line the walls of the ancestral home. Mortimer Brewster (Cary Grant), a writer who has repeatedly denounced marriage as "an old fashioned superstition", falls in love with Elaine Harper (Priscilla Lane), the minister's daughter who grew up next door to him. On Halloween day, Mortimer and Elaine marry. Elaine goes to her father's house to pack for the honeymoon and Mortimer returns to Abby (Josephine Hull) and Martha (Jean Adair), the aunts who raised him in the old family home. Mortimer's brother, Teddy (John Alexander), who believes he is Theodore Roosevelt, resides with them. Each time Teddy goes upstairs, he yells "Charge!" and takes the stairs at a run, imitating Roosevelt's famous charge up San Juan Hill. Searching for the notes for his next book, Mortimer finds a corpse hidden in the window seat. He assumes in horror that Teddy's delusions have led him to murder. Abby and Martha cheerfully explain that they are responsible, that they minister to lonely old bachelors by ending their "suffering". They post a "Room for Rent" sign to attract a victim, then serve a cup of elderberry wine spiked with arsenic, strychnine and "just a pinch of cyanide" while getting acquainted. The bodies are buried in the basement by Teddy, who believes they are yellow fever victims who perished in the building of the Panama Canal. While Mortimer digests this information, his brother Jonathan (Raymond Massey) arrives with his alcoholic accomplice, plastic surgeon Dr. Hermann Einstein (Peter Lorre). Jonathan is a serial murderer trying to escape from the police and dispose of his latest victim. Jonathan's face, altered by Einstein while drunk, resembles Boris Karloff's Frankenstein monster makeup. [Note 2] Jonathan learns his aunts' secret and proposes to bury his victim in the cellar. Abby and Martha object vehemently because their victims were "nice" gentlemen while Jonathan's victim is a stranger and a "foreigner". Jonathan also declares his intention to kill Mortimer. Elaine is impatient to leave on their honeymoon but is concerned about Mortimer's increasingly odd behavior as he frantically attempts to control the situation. He tries unsuccessfully to alert the bumbling police to Jonathan's presence. To draw attention away from his aunts and deprive them of their willing but uncomprehending accomplice, Mortimer tries to file paperwork to have Teddy legally committed to a mental asylum. Worrying that the genetic predisposition for mental illness resides within him ("Insanity runs in my family; it practically gallops. "), Mortimer explains to Elaine that he can't remain married to her. Eventually Jonathan is arrested, Einstein flees after having signed Teddy's commitment papers, and Teddy is safely consigned to an institution. His aunts insist upon joining him. Abby and Martha inform Mortimer that he is not a Brewster after all: his mother was the family cook and his father had been a chef on a steamship. Relieved, he lustily kisses Elaine and whisks her off to their honeymoon while yelling, "Charge!". The play was written by Joseph Kesselring, son of German immigrants and a former professor at Bethel College, a pacifist Mennonite college. It was written in the antiwar atmosphere of the late 1930s. Capra scholar Matthew C. Gunter argues that the deep theme of the play and film is the conflict in American history between the liberty to do anything (which the Brewsters demand), and America's bloody hidden past. The contemporary critical reviews were uniformly positive. 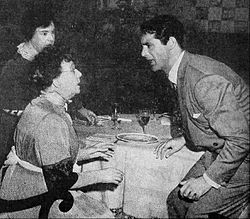 The New York Times critic summed up the majority view, "As a whole, Arsenic and Old Lace, the Warner picture which came to the Strand yesterday, is good macabre fun." Variety declared, "Capra's production, not elaborate, captures the color and spirit of the play, while the able writing team of Julius J. and Philip G. Epstein has turned in a very workable, tightly-compressed script. Capra's own intelligent direction rounds out." Harrison's Reports wrote: "An hilarious entertainment, it should turn out to be one of the year's top box-office attractions." John Lardner of The New Yorker called the film "practically as funny in picture form as it did on the stage, and that is very funny indeed." Twenty-four years after the film was released, Charles Higham and Joel Greenberg wrote Hollywood in the Forties where they stated that "Frank Capra provided a rather overstated and strained version of Arsenic and Old Lace". According to Warner Bros records, the film earned $2,836,000 domestically and $1,948,000 foreign. Arsenic and Old Lace was adapted as a radio play for the November 25, 1946, broadcast of The Screen Guild Theater with Boris Karloff and Eddie Albert, and the January 25, 1948, broadcast of the Ford Theatre. ^ As stated in an episode of This Is Your Life, Karloff was actually an investor and a producer of the stage play who received royalties whenever it was performed. ^ The self-referential joke highlights Karloff's portrayal of the character in the Broadway production. ^ a b "Movie Review - Arsenic and Old Lace". The New York Times. September 2, 1944. Retrieved February 26, 2016. ^ McGilligan 1986, p. 170. ^ Atkinson, Brooks. "Review: Arsenic and Old Lace." The New York Times,January 11, 1941. ^ a b Nixon, Rob. "The big idea behind Arsenic and Old Lace." Turner Classic Movies. Retrieved: June 25, 2012. ^ "Notes: Arsenic and Old Lace." Turner Classic Movies. Retrieved: June 25, 2012. ^ "Special feature section." Arsenic and Old Lace , DVD release: 65025.1B. ^ "Arsenic and Old Lace Synopsis." gbproductions.org. Retrieved: October 24, 2009. ^ Gunter 2012, pp. 49–51. ^ All credits: "Credits: Arsenic and Old Lace. "[permanent dead link] Turner Classic Movies. Retrieved: June 25, 2012. ^ "Film Reviews". Variety. New York. September 6, 1944. p. 10. ^ "'Arsenic and Old Lace' with Cary Grant, Raymond Massey, Peter Lorre and Priscilla Lane". Harrison's Reports. September 2, 1944. p. 143. ^ Lardner, John (September 9, 1944). "The Current Cinema". The New Yorker. New York. p. 51. ^ "AFI's 100 Years...100 Laughs" (PDF). American Film Institute. Retrieved 2016-08-05. ^ "Boris Karloff to Repeat 'Arsenic' Role Monday, WHP". Harrisburg Telegraph. November 23, 1946. p. 19. Retrieved September 13, 2015 – via Newspapers.com. Gunter, Matthew C. The Capra Touch: A Study of the Director's Hollywood Classics and War Documentaries, 1934-1945. Jefferson, North Carolina: McFarland & Company, 2012. ISBN 978-0-7864-6402-9. McGilligan, Pat, ed. Backstory: Interviews with Screenwriters of Hollywood's Golden Age. Berkeley, California: University of California Press, 1986. ISBN 0-520-05689-2.